Before this mouthwatering clash between two genuine European football heavyweights, most of the speculation amongst the German fans centred on which players would replace the injured Khedira and Gomez, and the suspended Hummels. Also, after switching to a back three against Italy, would Joachim Löw be tempted to stick with that formation in a bid to stifle a very effective Griezmann - Giroud strike partnership? For the French, Deschamps had a full squad to choose from, so most of the questions from the fans related to whether he would start with the team that looked so impressive against Iceland, or revert to the lacklustre lineup that started the tournament. With kick off approaching, the teamsheets were in. Germany went with a back four with Höwedes replacing Hummels, Schweinsteiger and Can came into midfield, the former for experience and the latter for his legs. Deschamps bravely stuck with the same 11 that started against Iceland, resisting the temptation to bring Kanté back into midfield. 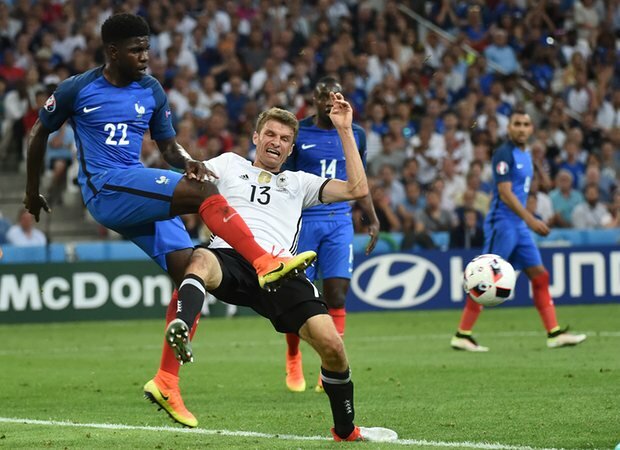 With the Tour de France in full swing, it was all eyes on the Stade Vélodrome as Germany were saddled with the task of putting the brakes on a French team gearing up towards another huge night in Paris this coming Sunday. France started the brighter of the two teams, moving the ball freely, especially down the right hand side. Germany actually looked anxious, under hitting passes and mis-timing tackles. 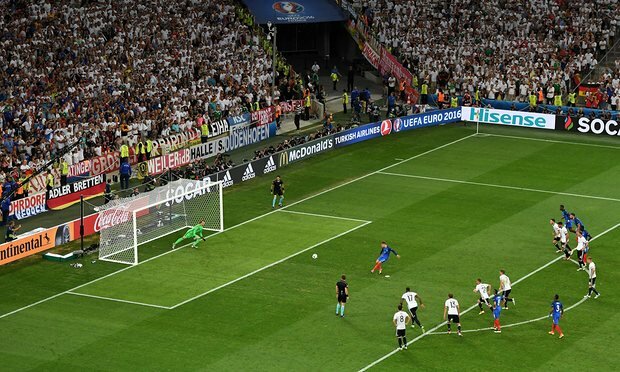 Griezmann fired the first warning shot on six minutes after some woeful defending allowed him to get a shot away that was well saved by Neuer. Germany didn't panic, they grew into the game and started holding onto the ball, using the width of the pitch to stretch the French back four. On 13 minutes it was France's turn to defend nervously, with Emre Can having a fine shot saved by Hugo Lloris after a good spell of German possession. From that point on France barely touched the ball, as the extra man in the Germany's five man midfield had the French players chasing shadows. 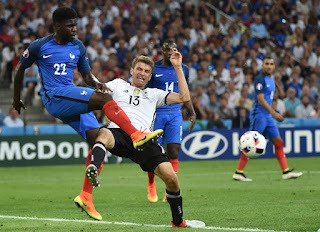 Apart from a few quick breaks, France struggled to mount any meaningful attacks as Germany turned the screw, it was starting to look like Les Bleus best hope was to hang on until half time and make some tactical changes. 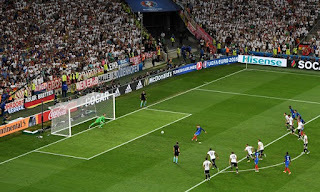 France did show flashes of the attacking brilliance that they displayed in previous games, with Griezmann shooting into the side netting and a Giroud break being snuffed out by an excellent challenge by Höwedes. However, with half time approaching it looked like being only a matter of time before Germany broke the deadlock. Then, in the last minute of the half, France won a corner on the right hand side. Inexplicably, Bastian Schweinsteiger handled the ball when he bungled an attempt at a clearing header, and the referee pointed to the spot. Up stepped Griezmann, who coolly stroked his powerful penalty into Neuer's goal and sent France down the tunnel a goal to the good. With France a goal up, Deschamps decided not to make any changes, and both teams kicked off the second half without making any substitutions. 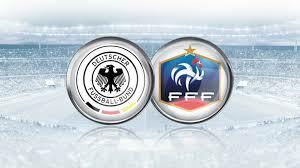 The goal had clearly lifted the French spirits, so as with the first half they started brightly, although once again Germany began to settle and started to dominate possession. Still though, France defended resolutely and kept Germany from creating any clear cut chances. Just before the hour mark disaster struck for Germany, when Jérôme Boateng went down with what looked like a torn hamstring, ending his night and probably ending his tournament no matter what the result of this game. With Mustafi coming on, the German centre back pairing was now very inexperienced indeed. Löw's next move was to replace Can with Götze, looking to add another attacking option, as Müller was looking isolated despite Germany spending most of the game camped around the French penalty box. After 71 minutes the inexperienced German defence crumbled. Under no real pressure, Kimmich failed to deal with a simple pass, Pogba stole the ball then sent over a cross that Neuer tipped into the path of the grateful Griezmann, who slotted home his second of the night. Would Germany have the belief to come back from a two goal deficit? Unfortunately for them, the answer was no. The game opened up, as Germany threw men forward in an attempt to force a goal, yet the French defence refused to yield. It seemed like nothing that Germany could do would change the outcome of this game. To the credit of the men in white, they refused to give in, pressing forward at every opportunity until the final whistle. However, when the whistle came, it was the team in blue that began the celebrations. 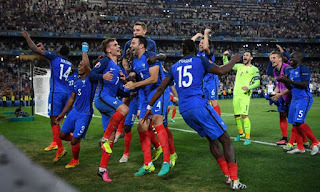 Despite being outplayed, struggling to keep possession, and hanging on for most of the game, France found a way to emerge victorious. There is an old saying in football that still rings true today: when you are on top in a game, you have to score. Germany did not, and now they are out. 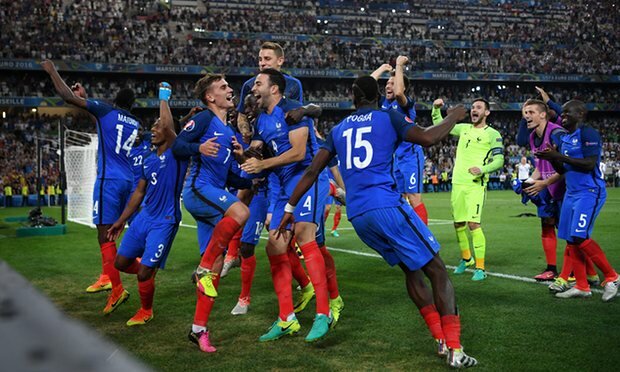 From 24, now we are down to two: Portugal v France. I know what I'll be watching on Sunday night, and it won't be Benidorm!